"JOURNAL No. 10 of the Holy Synod of the Russian Orthodox Church. 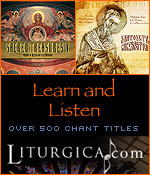 “HEARD: “The report of His Eminence Metropolitan Hilarion of Eastern America and New York, President of the Synod of Bishops of the Russian Orthodox Church Outside of Russia, interceding for the confirmation of the election of Priest Nicholas Olhovsky, a clergyman of the Eastern American Diocese, to the cathedra of Bishop of Manhattan, Vicar of the Eastern America Diocese. 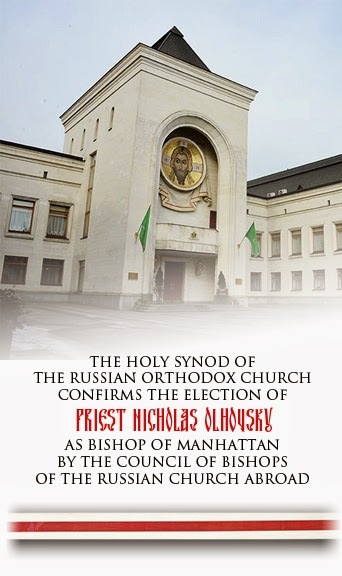 1) To deem Priest Nicholas Olhovsky unanimously elected by the Council of Bishops of the Russian Orthodox Church Outside of Russia as Bishop of Manhattan. 2) In accordance with the Act of Canonical Communion, to send an appeal addressed to His Holiness Patriarch Kirill of Moscow and All Russia and the Holy Synod of the Russian Orthodox Church to confirm this election. Priest Nicholas Olhovsky was born on December 17, 1974, in Trenton, NJ, to the pious Alexander Nikolaevich and Evdokia Grigorievna (nee Rusinovich) Olhovsky, who had fled the USSR during World War II. Baptized on January 18, 1975, in Dormition Church in that city. Graduated Hamilton West High School (NJ) in 1993, and graduated from St Alexander Nevsky Russian Parish School in Lakewood, NJ, in May 1991. From September, 1993, until May 1998, studied at Holy Trinity Seminary in Jordanville, NY, where he received a Bachelor of Theology Degree. Executed his obediences in the book-binding shop, icon studio and typography (working in the latter until 2002). On the feast day of the Dormition of the Most-Holy Mother of God in 1994, ordained a reader by Bishop Hilarion of Manhattan, Vicar of the Eastern American Diocese, in Trenton’s Dormition Church. From September 1998 until December 2000, studied at State University of New York Technology School, receiving a bachelor’s degree in Information and Communications. 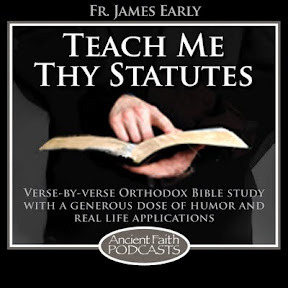 From March 1999 until March 2008, served as the cell-attendant of Archbishop (and since October 2001, Metropolitan) Laurus. In May, 2004, he was a participant of the first official visit to Russia of Metropolitan Laurus of blessed memory, the First Hierarch of the Russian Orthodox Church Outside of Russia. On November 14 of that year, he married Elizabeth Panteleimonovna Shohov. On January 8, 2005, ordained a subdeacon by Metropolitan Laurus. In May, 2006, served as a delegate to the 4th All-Diaspora Church Council. 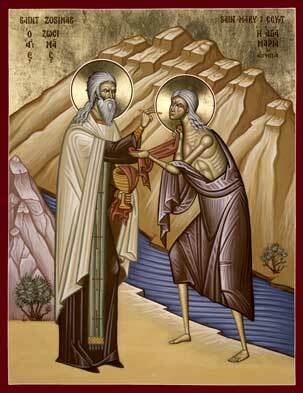 On June 12 of that year, ordained by Metropolitan Laurus to the diakonate, and assigned to Holy Trinity Monastery. In May, 2007, participated in the celebration of the signing of the Act of Canonical Communion in Moscow, accompanying Metropolitan Laurus in the subsequent pilgrimage to the Kursk Diocese and the Ukrainian Orthodox Church of the Moscow Patriarchate. On June 16, 2008, was awarded the double horarion. In July of that year, accompanied the reliquary containing the hand of St Elizabeth and Nun Barbara to Australia. In September 2008, assigned to the Staff of the Synod of Bishops. In May, 2009, appointed to the organizing committee of the trip to Russia of the Kursk-Root Icon of the Mother of God "of the Sign.” In September 2009, a member of the delegation accompanying the Kursk-Root Icon of the Mother of God to Russia. In 2010, accompanied the Kursk-Root Icon of the Mother of God to Kiev, Suma and Kursk. On September 8, 2010, became a widower. In December 2010, appointed the Caretaker of the Kursk-Root Icon of the Mother of God "of the Sign.” In January 2011, appointed a clergyman of the Synodal Cathedral of Our Lady “of the Sign” in New York, and granted a residence at the Synod. In September 2011, accompanied the Kursk-Root Icon of the Mother of God to the Kursk Diocese and the Metropoliate of the Republic of Kazakhstan. In November 2011, accompanied the miracle-working icon to Australia. 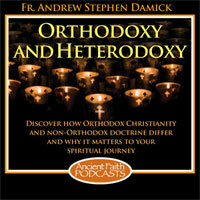 On December 18, 2011, elevated to the rank of protodeacon. On August 1, 2012, ordained to the priesthood and granted the nabedrennik at St Seraphim Church in Sea Cliff, NY. In September 2012, accompanied the Kursk-Root Icon of the Mother of God to the Samaran, Kursk and Perm Dioceses. In December 2012, accompanied the Kursk-Root Icon to Seattle and Hawaii. On January 6, 2013, was awarded the kamilavka and gold pectoral cross by the Synod of Bishops. In March/April, 2013, accompanied the Kursk-Root Icon to the Canadian Diocese. In November 2013, was a delegate accompanying the Icon to Japan and to the Primorsk Metropoliate of the Russian Orthodox Church.